American spending on plastic surgery cracked the $15 billion mark fairly recently. Never before in history has plastic surgery been more popular than it is right now. Both men and women are getting a wide variety of plastic surgery treatments done for an even wider variety of reasons. Still, some people have questions and concerns about cosmetic surgery. As a Maryland cosmetic surgeon, I strive to give you the information you need to make a good decision when considering plastic surgery. 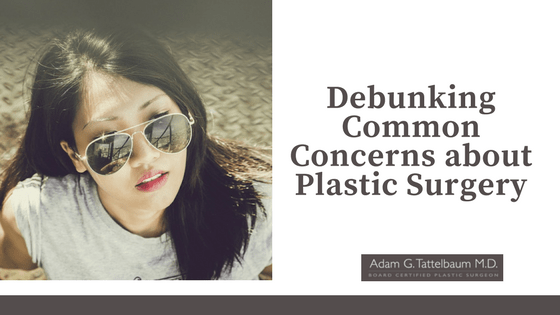 There are quite a few different myths about breast implants out there. Some people think that getting breast implants increases your risk of having breast cancer, or that you will lose the ability to breastfeed. Neither of these are true. Numerous studies have shown that there is absolutely no link between having breast implants and getting breast cancer. You should regularly check yourself, of course, but there is absolutely no correlation between these two. The FDA is investigating a rare type of lymphoma that may be linked to some textured implants, but the incidence is so low that it is simply being studied at this point. In addition, women who have had breast augmentation can usually breastfeed if they wish to have children. If you have had issues with breastfeeding before you had your surgery, breast implants are not likely to fix that. For those who have not had issues, however, most women will not have problems. When most people picture someone who has gotten plastic surgery, they imagine some trophy wife with more money than sense, or a celebrity who is trying to stay popular. Neither of these are completely true. Most plastic surgery, in fact, the best plastic surgery, is when you can’t even tell it has been done. Many forms of plastic surgery are more affordable now than they have been in the past. Certain treatments, like injectables, are attainable by a wide variety of people. Like with many services, it is a good idea to educate yourself and learn about what you are getting. Plastic surgery for men is becoming more and more widely accepted. As a matter of fact, in 2016 (the most recent period with information), more than 1 million men got plastic surgery. We saw an increase in the number and the rate of men getting cosmetic surgery between 2015 and 2016, and it is likely that we will see the numbers increase again. Men can be good candidates for a wide variety of treatments, from blepharoplasty to liposuction. Some men have even found it useful to get cosmetic breast surgery. For those struggling with issues like gynecomastia, cosmetic surgery can help with body image. There is no one-size-fits-all solution. Everyone has their own areas of concern. Good candidates are, generally, healthy people who eat right and exercise regularly. Every operation has its own risks, and has its own requirements of people. Some operations are not for everyone. If you have health concerns, it is a must to bring that up with your surgeon. Many people think that getting plastic surgery is a sign of vanity or egocentrism. Most often that is not the case. We all have areas of our body that we do not always like, even if we have a high self-esteem and a strong sense of self-awareness. We believe in helping people achieve the look that they want. Moms want to get their figures back. Men and women want to correct their noses. Dads may want to have their eyelids adjusted. Whatever the case may be, there is nothing wrong with wanting to look a little better and hopefully feel normal. At AT Cosmetics, we want to help you. Our highly-qualified team has performed many successful surgical and non-surgical treatments, and the next success story could be yours. If you have any questions, or if you want to know if you are a candidate, schedule a consultation with us today. Dr. Adam Tattelbaum can be your Maryland cosmetic surgeon.